Cleared "Lost Wish, Tumultuous Heart." Cleared "A Gleam of Hope." Cleared an Extra Quest with only Kirito and Silver Crow. Cleared an Extra Quest with only Asuna and Black Lotus. Cleared an Extra Quest with only Sky Raker, Ardor Maiden, and Aqua Current. Completed all of Hexe's requests. Destroyed a solid Otherworld object. Used BP to buy something. Defeated the aura-clad monster general. Raised one character's level to 500. Raised one character's level to 1000. 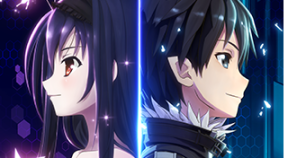 Raised one SAO character's skill level to 500. Raised one AW character's skill level to 500. Enhanced one weapon to +10. Raised a weapon from Rank 1 to Rank 10. Obtained 100 different types of equipment. Chained together 8 skills with Skill Connect. You Said It, Miss Strea! Started episode 5 of "Say It, Miss Strea!"